Tiki Madness is located in San Diego, CA. Polynesian, Hawaiian and other Pacific Island groups are represented in our woodcarvings. Our tikis are hand carved from palm trees. Tiki Madness does several different cuts - quarter, half, and full round. The palm trunks are stripped 2 layers down, smoothed out, carved, bleached, burned, color stained or clear coated. Each Tiki is unique and one of a kind. Our Tiki Boutique accessories enable anybody to bring that tropical paradise to your backyard or special room. You can see some of our Tikis in Disneyland Park, CA. and Caliente Tropics Hotel - Palm Springs. CA. We also would like to thank the San Diego businesses that have purchased our tikis and put them on display at their location. DaKine Restaurant (National City), Seau's (Mission Valley), Yokozuna's (Chula Vista), Sushi on a Roll (Kearney Mesa), Green Garden Nursery, Classic Island Designs & Deziner Eyes (Pacific Beach), Dukes Gridelle N Grill (San Clemente), Surf Hut, (Imperial Beach), Rocky's Surf Shop (Ocean Beach), Motu Hawaii (Mission Beach). Bali Hai Restaurant (Shelter Island). 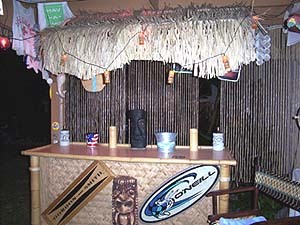 Palapas by Tiki-Madness are tropical-style thatched structures. Only pressure treated lodge pole framing used, imported authentic palm thatched top. We build on site to your specifications. See our custom Palapas at Catamaran Hotel in Pacific Beach, CA. We encourage local and nearby areas to come see us. We attend Craft Fairs throughout the year. 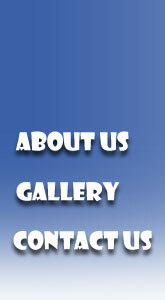 Check our web site for event updates listed on the "Contact Us" page.